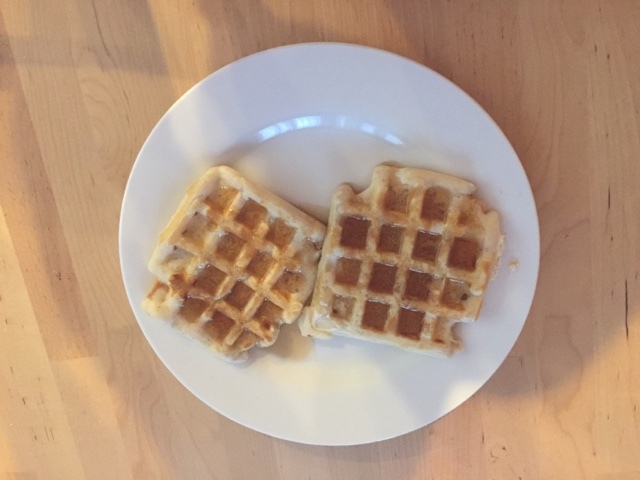 Ever since we bought the waffle iron at the end of March, I have been searching for a fantastic and delicious yet easy waffle recipe to use. I had tried so many and most were just eh and left me wanting more from a waffle recipe. In early June, we were having waffles for supper since it was a double soccer night which meant we had to be finished and ready by 5:15pm. I decided instead of searching for just easy waffles or buttermilk waffles, I would try belgian waffles. It was so good and it made about 14 waffles which meant lots to freeze for breakfasts too!! I am still working on my waffle iron skills but thankfully they taste better then they look!! Look for the recipe down below! !